A year ago, I made a doctor’s appointment. Stupid me. I made that appointment for 8:15 AM. Most days, that’s before even the baby gets up. When I called last week to see if I could push it back, they were booked up, so I had to keep the 8:15 appointment because I really needed to get the prescription refilled. I had to actually wake L up and get her dressed so I could go to this appointment. I know she’s too little to understand, but I told her we could stop and get donuts on the way home. I was just going to stop at Sweetwater’s, but I took West Main home so I could drop my prescription off at Walgreens. 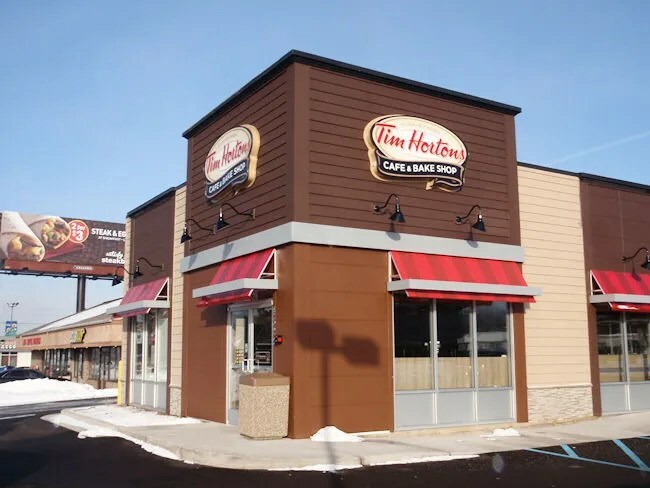 As I got closer to Drake Road, I remembered that Tim Horton’s recently opened a second Kalamazoo location…and I’ve never had Tim Horton’s breakfast. 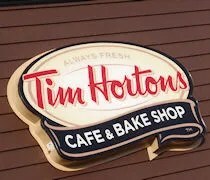 The newest Tim Horton’s in the Kalamazoo area is on West Main Street near North Sage Street. The new building is kind of wedged into the busy commercial area in Kalamazoo’s Westwood neighborhood. I’ve always liked Tim Horton’s as a less pretentious way of doing the coffee shop. They offer free Wi-Fi and some lounge chairs for those needed to sip a little coffee while doing some work. I walked in to the shop and found a small case of donuts near the cash register. I was really hoping they would have what seems to be the elusive vanilla long john. Like Dunkin Donuts, they did not. They have some pretty delicious cinnamon sugar donuts, so I got two of them. One for me. One for L.
I also happened to look up at the electronic menu boards above the counter as I walking to pay and saw a picture of the Bagel Breakfast Sandwich, so I got one of them two. The bill for the three breakfast items was under $5. The donuts were bagged up as I was swiping my credit card and the breakfast sandwich was put together by the time I walked over to the sandwich area to pick it up. When we got home, I broke up one of the donuts for L who proceeded to throw it on the floor. It’s hard to get made at her for not wanting to eat sweets, so I just laughed and picked it up. I ate about half of her donut and the whole other one for myself. When J got home from work, she saw the other half of the donut sitting on the tray of L’s high chair and assumed it was up for grabs. L was more interested in the sandwich I was eating and she reached for it after tossing her donut. I decided to be nice and I tore of a few pieces of egg for her. The sandwich is a pretty simple construction of egg, cheddar, and bacon (ham or sausage also available) on a flaky buttermilk biscuit. The sandwich was quite large for the price, but not larger enough for two. The way L was stealing my sandwich, I’m fairly certain she could have eaten a whole sandwich by herself. 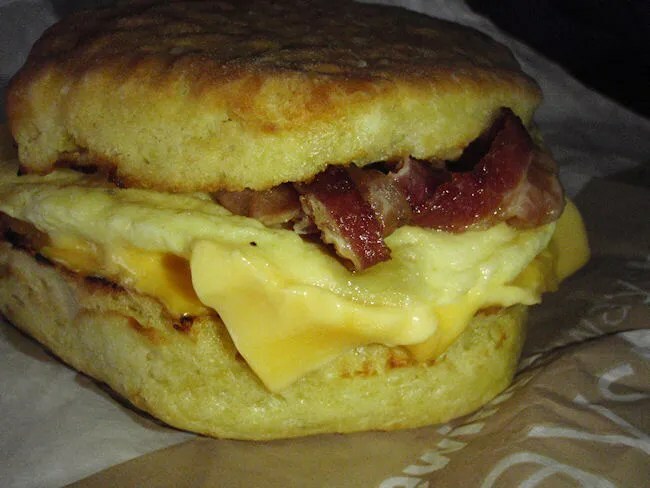 I was pretty impressed with Tim Horton’s breakfast. The donuts were alright…definitely not Sweetwater’s, but what place is? I really liked the Breakfast Sandwich. I guess I didn’t realize they did the sandwiches, but it makes sense that they do. 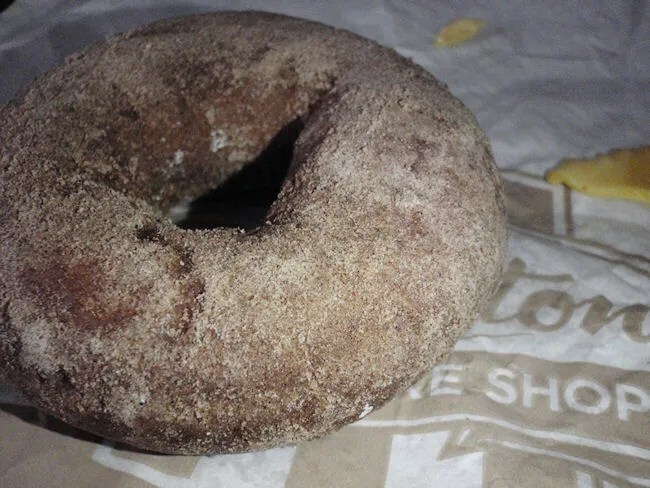 I’m not out in the morning much, but Tim Horton’s is close enough to home that if I need a little something for breakfast, I’ve got a place to get something cheap and quick. I don’t know how far north you get, but Cops & Donuts in Clare Mich has good donuts and sweet rolls! It is owned by some of Clare’s Police Officers! This Tim Horton’s was built on a piece of land that was vacant for many years. There used to be a Pizza Hut on this site. Had my first Tim Horton’s last month when I was in Frankenmuth, I now why Baby L threw it away, She is a smart Kid! The donuts aren’t great…but I like the breakfast sandwiches….